Amazon.in historical owner info, name servers, Analytics ID, Adsense ID, Addthis ID, advertisers, screenshots, meta tags, whois, site and server info. 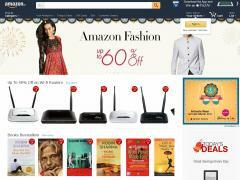 Amazon.in: Online Shopping India - Buy mobiles, laptops, cameras, books, watches, apparel, shoes and e-Gift Cards. Free Shipping &amp; Cash on Delivery Available. Sites related to Amazon.in based on metadata.